You can join in with songs about adding and taking away. You can look at two bowls of apples and say which one has more in. You can look at two plates of apples and say how many you need to add or take away to make them the same. 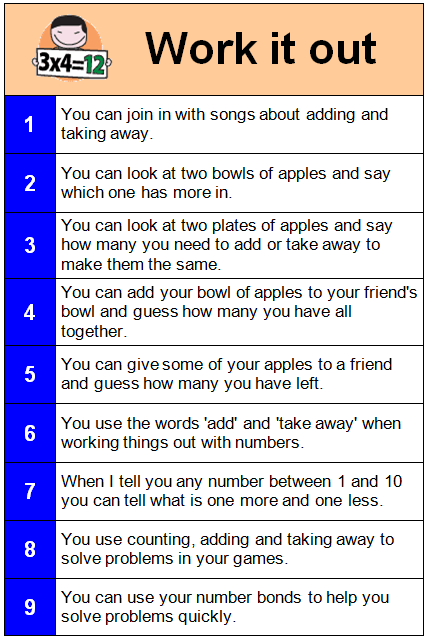 You can add your bowl of apples to your friend’s bowl and guess how many you have all together. You can give some of your apples to a friend and guess how many you have left. You use the words ‘add’ and ‘take away’ when working things out with numbers. When I tell you any number between 1 and 10 you can tell what is one more and one less. You use counting, adding and taking away to solve problems in your games. You can use your number bonds to help you solve problems quickly.